ALL RESPONDENTS acknowledge the significance of King’s critique of U.S. capitalism and economic inequality, especially the extreme disadvantage of the country’s ghetto neighborhoods. 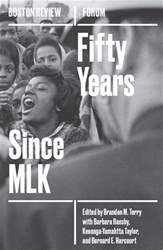 Jeanne Theoharis rightly argues that our memory of King obscures the connections he saw between the ideological and material foundations of the Jim Crow South and the practices that built urban ghettos: residential and school segregation, job and housing discrimination, unjust policing and sentencing, social isolation, systemic disinvestment, and political subordination. Andrew Douglas adds that King’s critique of a “thingoriented” society exposes how “racial capitalism” persistently frustrates and forecloses efforts at human connection. Broaching the problem of political economy, Douglas presses “the question of how King’s call for a revolution of values is complicated by the production and circulation of value in capitalist society,” especially one shot through with racist ideology.